If you are a motorcycle lover you’ve probably dreamed of owning a brand new big boys’ bike – well here’s a four-year-old Harley-Davidson CVO that will ride like it’s brand new because it has just four miles on the clock. Yes, four miles! CVO (Custom Vehicle Operations) motorcycles are rare models created by Harley-Davidson for the factory custom market. 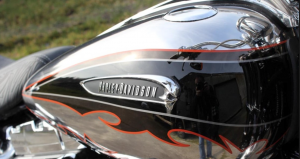 Every year since 1999, Harley-Davidson has created limited-edition customisations with larger-displacement engines, more expensive paint designs, and additional accessories not found on the mainstream models. CVOs are more expensive than the models from which they are derived, but buyers don’t seem to be put off by the hefty price tag. The Harley-Davidson CVO coming up for auction is expected to fetch as much as £24,000 when it goes under the hammer. It is a 2014 model although it was not registered until November 8 2016 and it has been kept as part of a private collection. It has been started occasionally, but it has not been ridden, hence the delivery mileage of just four miles. The finish is stunning – Molten Silver and Black Diamond with forged iron graphics, and a beefy 1800cc engine to give a suitably guttural roar. When launched there was an 18-month waiting list and this is thought to be the only one available with delivery mileage. 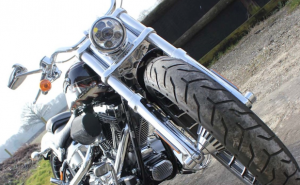 The Harley-Davidson CVO is being sold by Historics at Brooklands at Ascot on Saturday, March 3. If you are lucky enough to own a performance motorcycle like this you will want to know the best way to protect it. Bikesure is the specialist motorcycle insurance division of Adrian Flux and has access to a wide variety of specialist performance bike insurance schemes. They are cheap, comprehensive and tailored to your exact needs.